Sami Olsen (left) and Marc Van Gelder pose durin this year's US Club Soccer National Cup XVI Finals. 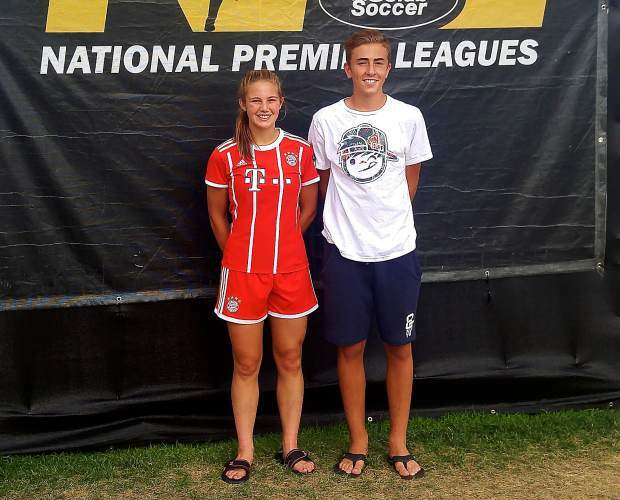 With the start of high school soccer just weeks away, a few Truckee youngsters have kept busy on the pitch during summer vacation, playing at the club level with Reno-based teams. Recently, a pair of those players, Marc Van Gelder and Sami Olsen, helped guide their teams to championship games in Aurora, Colo., at the US Club Soccer National Cup XVI Finals. Van Gelder, who will enter his sophomore year at Bishop Manogue Catholic High School in Reno and sports a 4.1 weighted GPA, plays outside back for Nevada United 03 Red. Ven Gelder and the team would reach the finals of the 15-and-under Boys Premier Group tournament after sweeping a trio of opponents by a combined score of 11-2. In the finals against Chicago-based Deportivo Juniors 03, Nevada United jumped out to a 3-1 lead after one half of play, but the Deportivo Juniors responded by opening the second half with two quick goals. A little later into the half the Deportivo Juniors struck again for a 4-3 lead. Nevada United Coach John Zebrack would go to his bench for fresh legs, Van Gelder said, which quickly produced the equalizing goal. The two clubs then battled through two 10-minute overtime periods but neither could find the back of the net. Nevada United had an opportunity at the game winner in the second overtime period with a penalty kick, said Van Gelder, but weren’t able cash in, sending the game into penalty kicks. After falling behind early on in the shootout, Nevada United’s goalie propelled the team to a championship after first coming up with a save, followed by knocking in the game-winning penalty kick. The team will be back in action on Saturday in Sacramento with a chance to qualify for the National Premier Leagues, a group of nine leagues across the country. The team is 3-0 thus far in qualifying games and needs a win or a tie to enter the league. If Nevada United reaches the National Premier Leagues level, Van Gelder will be looking at double duty during the fall as a member for the club and also the Manogue Miners soccer team. In the girls’ tournament, Olsen, who has spent the summer competing on the other side of the country in Maine, helped the underdog GPS Maine Phoenix 03 reach the finals of the girls’ 15-and-under tournament. The team came in without high expectations for a tournament run, according to Olsen, but managed to reach the finals against Northern California-based West Coast Soccer Kaos behind three straight upsets of teams by a combined margin of 6-1. Unfortunately, Olsen and her team would come up shy in the championship game, suffering a 2-1 defeat in the finals against one of the top ranked teams in the nation. Olsen’s Maine-based squad allowed two quick goals to open the contest, but shutout West Coast Soccer Kaos over the remainder of the game. Olsen said the team had its chances to even the game in the second half, but couldn’t find the game-tying goal. “It was a fight,” she said. “It was physical, and the team played very hard”. Olsen, who was part of Truckee’s state champion soccer team last year, said she will remain in Maine this fall and will play high school soccer for Cape Elizabeth High School. Three other locals played last weekend in Southern California at one of the nation’s premier summer tournaments for youth soccer, the San Diego Surf Cup. Amy Van Gelder, who is Marc’s twin sister, joined Carly Davis, and Jessie Sambrialo to play for Reno-based San Juan Spirits 03. The team won the championship out of one of the lower tiered brackets last year, and competed against the highest level of competition at this year’s tournament. Playing in the 16-and-under girls’ division against 16 other squads, the Spirits would go 2-1 in their bracket to finish in second place out of their four-team pool. Only the first-place teams from each bracket advance to the semifinals. The Spirits would go on to drop their final game of the tournament, falling 3-1.